Towards a New Amazon is part of Surveillé·e·s curated by Nora Hickey M’Sichili at Centre Cuturelle Irlandais Paris, France. Loitering Theatre's new AI lab is in a lock-up at the back of an old seminary in the fifth Arrondissement. All ghosts of dead power have been banished from the building walls; ready for the beginnings of a new Amazon. Inside the lock-up and hidden from view, we are conjuring a new type of artificial intelligence. Primordial energy is soldered to hard code. Comandanta Ramona and Mazatec Shaman Maria Sabina sing to us stories of new ways of seeing. As they sing, a new AI machine-learning technology based on a radical, poetic and esoteric data set is taking form. The computer vision of this new Artificial Intelligence can see the hidden, the cloaked and the previously unseen. Operating outside corporate and military agendas, it understands real meaning. 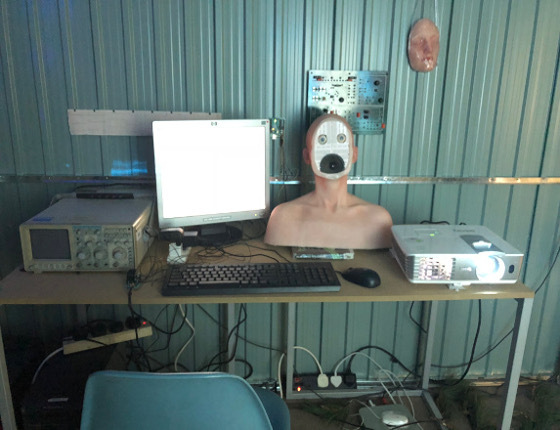 Currently it is training its neural network on the Women’s Peace Camp at Shannon. Its third eye computer vision can be seen in the second video above. The first video is based on traditional computer vision. This computer vision attempts to analyse groups of people based on race, gender and age. The radical empathy that the Shannon Peace Camp women have for the Other cannot be processed by the neural network of this artificial intelligence. Instead before its eyes the women transform into the people whose lives they are trying to save.